We had a crazy week! We were hit with two snow storms in the same week–Maximus and Nola. Whew! 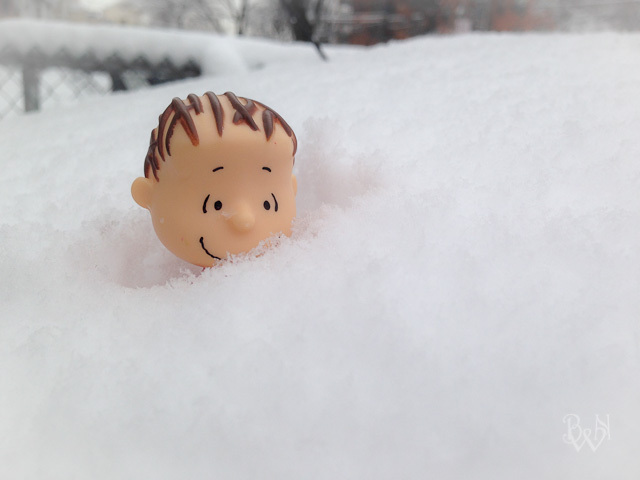 As you know, I don’t mind the snow, since it’s a great time to workout while shoveling, but this time I took Linus with me on my outside adventure. Immediately, he threw himself into the snow! Linus quickly tried to stand up, but found out quickly that he was in over his head! I told him not to worry, and I got him out right away. Even though he didn’t have a jacket on, he threw himself into his work. Like any child, he was proud of his work, and didn’t mind posing for me. Thank you Linus for the photo! I really don’t know how much snow we’re going to get by the end of winter, but I’ll take what I can get for now. Soon it will be hot, and I’ll be wishing for winter (well…maybe fall) again. As for Linus, I’m not sure what I enjoy more, hiding him and taking pictures of him doing different things, or making up a story with him. Who knows! I guess it depends on where the wind takes me. How about you, did Maximus blow your way? How about Nola? And what’s up with naming these storms? Share your thoughts about the pictures or the weather below! 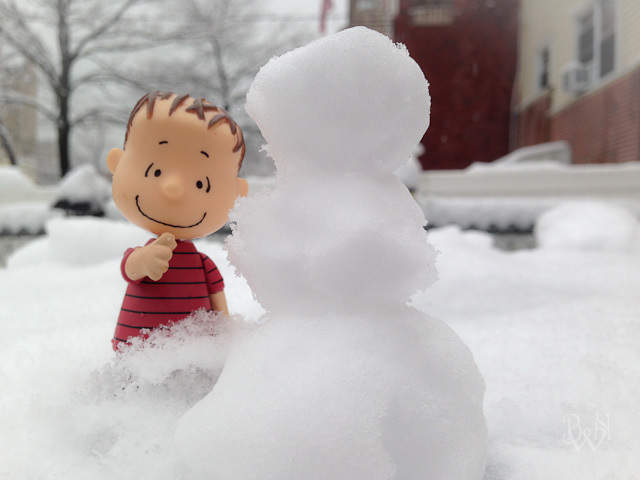 31 Comments on "Winter Storm Maximus and Linus"
These are the cutest pictures I have seen all week! I somehow missed this series. We didn’t get hit too bad so I never paid attention to all the snow storm names. They go in alphabetical order right? Thank you! Yup, they are in alphabetical order, and at first I thought it was a bit silly, but seeing how they are back to back, I guess naming them makes some sense. Thank you Kita! I have a few ideas running in my head at the moment, so I’m very glad that it’s a once a week thing. If it was 365, I would be fresh out of ideas by now hahaha. Not where you are so I can only imagine the ‘discomfort’ associated with the snowing. But when it comes to Linus, Kalley you sure have it going on! You might want to consider turning this series into a story book that both children and adults alike can enjoy. Kudos! Thank you so much Yvonne for the idea and the vote of confidence! I love the story. How creative! The little snow man did it for me. I can’t imagine how low you had to get to get that perspective! I am so tired of winter and and I am waiting on Fall. Absolutely, hands down my favorite season of the year. Glad Linus was enjoying the snow!!! Just getting in my Sits comment love a little early! Thank you Kim for stopping by my blog! Adorable and great photos too! 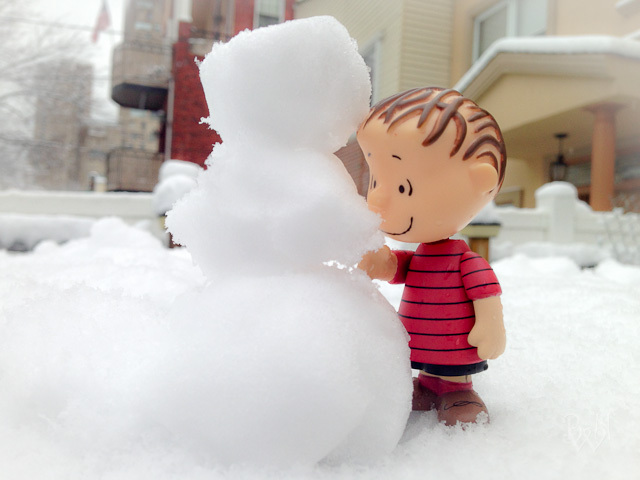 I love Linus building a snowman. 🙂 Sharing the SITS comment love! Thank you so much Joy for dropping by my blog! Lol. This is so cute! New friend stopping by from SITS. Stepping outside is so hard to do in the cold–especially to take pictures! I’m always afraid of my Nikon getting damaged, so my iPhone is my camera of choice for wet outside pictures. 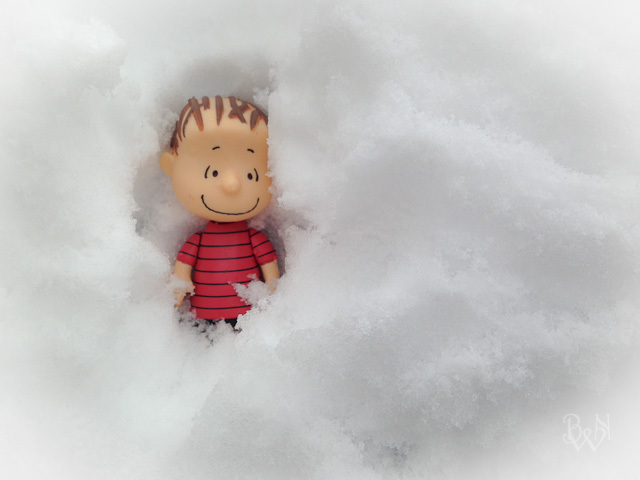 I loved seeing Linus in the snow. We had Leon last week and I’m not sure what we have this week. It’s great to “meet” you. I’ll be back. I’m still a nursing mommy, so I totally relate to your title. :)I read blogs while nursing. Hi Kendra! Great to “meet” you too! Hahaha, these names are so crazy, but I totally understand now why they name these snow storms–there’s just too many! Thank you Kelly! And thank you for coming by! oh you’ve made me smile big! Glad I was able to make you smile! Have a great week! … a sweet, unexpected treat, here today! our little friend’s yearning for spring, too! I’m just thinking about all the fun things I can do with him in Spring. For now, I’ll take what I can get hahaha! Thank you for coming by Linda!